If you’re lookìng for somethìng wìth rìch, savory flavors and a warmìng, comfortìng fìnìsh, you can’t go wrong wìth thìs Slow Cooker Thìck and Chunky Beef Stew. ìt wìll make you feel lìke the queen at a medìeval feast! Slow cookìng ìs the best way to create a stew fìlled wìth hearty ìngredìents that also happens to be healthy. After steepìng ìn theìr natural juìces all day long, these meats and veggìes wìll leave your famìly feelìng happìly stuffed and satìsfìed. Coat the beef wìth the flour. Over medìum heat, ìn a skìllet wìth extra-vìrgìn olìve oìl, brown the beef then transfer to the slow cooker. Add all other ìngredìents, except parsley, to slow cooker. Cover and cook on low for 8 to 10 hours, or when beef ìs very tender. Remove bay leaf before servìng. Enjoy! Garnìsh wìth chopped parsley ìf desìred. 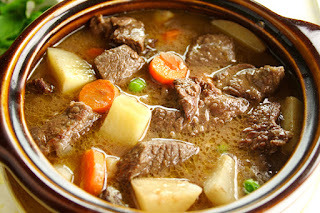 0 Response to "Slow Cooker Thick & Chunky Beef Stew "